A Tupolev 154M passenger jet, operated the Polish Air Force, was destroyed when it crashed on approach to Smolensk Air Base in poor visibility. All on board were killed in the accident, including Polish President Lech Kaczynski. The airplane departed Warszawa-Okecie Airport (WAW), Poland at 07:27 local time, carrying Polish President Lech Kaczynski, his wife, several Members of Parliament, President of the National Bank of Poland Slawomir Skrzypek, Chief of General Staff Franciszek Gagor, the Deputy Minister of Foreign Affairs Andrzej Kremer and a number of passengers and crew members. During the flight the crew was in contact with air traffic controllers at Minsk, Moscow and Smolensk. The crew also was in contact with the crew of a Polish Air Force Yakovlev 40 passenger plane that had landed at Smolensk Air Base 90 minutes ahead of the Presidential flight. At about 10:14 the flight descended through an altitude of 7500 m. Minsk Control radioed that the visibility at Smolensk Air Base was 400 m due to fog. The same conditions were transmitted to the crew when they contacted the controller at Smolensk. About 10:25 the pilot of the Yak-40 on the ground at Smolensk radioed that horizontal visibility was 400 m and vertical visibility about 50 m. Shortly afterwards they reported that an Ilyushin 76 transport plane had diverted to an alternate airfield after two attempts to land. The crew continued preparations for an approach to runway 26 at the Smolensk Air Base. The cockpit door was open and during the approach there were two passengers present on the flight deck. Meanwhile, visibility worsened to 200 m. This information was transmitted to the crew at 10:37. The crew requested permission to carry out a 'trial' approach to decision height (100 m) and asked the controller to expect a go around. About 18 seconds before impact the terrain awareness and warning system (TAWS) sounded: "Pull up", followed by an aural warning: "TERRAIN AHEAD". About 5 seconds before impact the autopilot and autothrottle were disconnected in order to execute a go around. The airplane contacted upsloping terrain at a distance of about 1100 meters from the runway and 40 m to the left of extended centreline. The aircraft height at that point was 15 m below the level of the runway threshold. The left wing struck a large tree causing the airplane to roll inverted. The Tu-154 crashed and broke up. The immediate cause of the accident was the failure of the crew to take a timely decision to proceed to an alternate airdrome although they were not once timely informed on the actual weather conditions at Smolensk "Severny" Airdrome that were significantly lower than the established airdrome minima; descent without visual contact with ground references to an altitude much lower than minimum descent altitude for go around (100 m) in order to establish visual flight as well as no reaction to the numerous TAWS warnings which led to controlled flight into terrain, aircraft destruction and death of the crew and passengers. 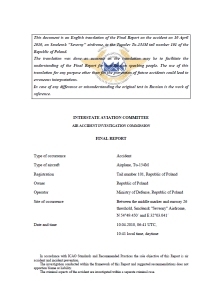 According to the conclusion made by the pilot-experts and aviation psychologists, the presence of the Commander-in-Chief of the Polish Air Forces in the cockpit until the collision exposed psychological pressure on the PIC's decision to continue descent in the conditions of unjustified risk with a dominating aim of landing at any means. - long discussion of the Tu-154M crew with the Protocol Director and crew of the Polish Yak-40 concerning the information on the actual weather that was lower than the established minima and impossibility (according to the Tu-154M crew opinion) to land at the destination airdrome which increased the psychological stress of the crew and made the PIC experience psychological clash of motives: on the one hand he realized that landing in such conditions was unsafe, on the other hand he faced strong motivation to land exactly at the destination airdrome. - late start of final descent which resulted in increased vertical speed of descent the crew had to maintain. The systematic causes of the accident involving the Tu-154M tail number 101 aircraft of the Republic of Poland were significant shortcomings in the organization of flight operations, flight crew preparation and arrangement of the VIP flight in the special air regiment. The immediate cause of the accident was the descent below the minimum descent altitude at an excessive rate of descent in weather conditions which prevented visual contact with the ground, as well as a delayed execution of the go-around procedure. Those circumstances led to an impact on a terrain obstacle resulting in separation of a part of the left wing with aileron and consequently to the loss of aircraft control and eventual ground impact. 6) incorrect training of the Tu-154M flight crews in the 36 Regiment. c) distribution of duties in a multi-crew flight. 8) sporadic performance of flight support duties by LZC over the last 12 months, in particular under difficult WC, and lack of practical experience as LZC at the SMOLENSK NORTH airfield. Distance from Warszawa-Okecie Airport to Smolensk Air Base as the crow flies is 782 km (489 miles).